Few Americans today venture much deeper into herbal medicine than the occasional cup of chamomile tea or bar of oatmeal soap. We don’t even cook with herbs nearly as much as we once did, unless we’re cooking Mediterranean, and hardly anybody has an herb garden. But a hundred fifty years ago or more in North Carolina, you’d have used herbs for food, for medicine, for aromatics, and for dyes. And many herbs had multiple uses. You’d have used thyme to flavor a stew or enhance a salad, but you might also have used it to (as the great herbalist Nicholas Culpeper said) “purge the body of phlegm” or eliminate intestinal parasites. You might have used bloodroot, a local wildflower, to make a red dye for clothing, but it could also be used as a mouthwash. Roses smelled sweet, as Shakespeare famously said, but they could also flavor cakes or cure a headache. From the common pine to the lovely rose, from wild lettuce to English thyme, almost every plant North Carolinians have known has found a use at the table or in the medicine chest — and sometimes both, because food and medicine were often one and the same. Around the turn of the nineteenth century a woman named Rachel Allen lived with her husband John in the area of Snow Camp, in what is now Alamance County, North Carolina. The Allens were Quakers; Rachel was a midwife as well as a practitioner of herbal medicine in her community. Those two skills often went together; in communities without a doctor, the woman who delivered babies might also tend to the needs of the sick. (And given the state of professional medicine at the time, even in communities with a doctor, you were generally better off with the midwife in any case.) In England, it was often the country parson who was expected to know some herbal medicine, since he was going on rounds to people’s homes and visiting the sick anyway. A parson’s wife who could tend the herb garden and prepare remedies was therefore much valued by a community. The Allens’ house still stands, interestingly; it’s been moved to Alamance Battleground State Historic Site and is open to visitors. Built in 1780, it’s made of logs; it has only one room with a loft, yet the Allens had some very nice furniture, including a grandfather clock – they were not poorly off by the standards of their time, yet the house is tiny by the standards of ours, and it says a lot about how ordinary people lived two hundred years ago. The John and Rachel Allen House at Alamance Battleground State Historic Site. Photo by the author. We also have something equally interesting — Rachel Allen’s “receipt book,” which is in the North Carolina State Archives. Most literate women kept these books in which they jotted recipes — or as they said, “receipts,” something they’d received from someone else and thus needed to write down. An English manuscript cookbook, 1731, from the Virginia Tech Library. ashes in White wine an ounce will often dissolve ye Stone. Verdigris ground with mortar and pestle. Photograph from LivingPast.com, which seems to have gone defunct since I gave this talk. Sometimes put in with Them. Some other wild herbs used by North Carolinians include balm of gilead, blackberries, blackberry roots, boneset, borage, buckvine, catnip, cherry tree bark, clover blossoms, comfrey, elderberry roots, ginseng, golden seal, heart leaf, ink balls, jimson weed, mullein, wild onions, pennyroyal, pine bark, poke weed, rat’s vein, sassafrass, snake root, and spice wood. And that’s just in the mountains. A stalk of flowering agrimony growing wild in Ireland. Photograph by Bart Busschots licensed Creative Commons. Clearly, then, this was no simple matter. Like most midwives and herbalists, Rachel would have learned her craft from older female relatives, and there was a great deal of practical knowledge an herbalist had to have, and potentially a great deal of work involved. Simply to collect and use wild herbs, she needed a broad knowledge of plants, including seasonal changes in appearance and the various kinds of habitats in which each species might be found. Some might grow only in heavily shaded areas near streams, while others were found in sunny meadows or at high elevations on mountainsides. She also had to know when to collect each herb, and what part of the plant to collect. Some herbs were believed to be most potent in spring, others in late summer or fall, and of course if it was the flowers you were after, you had to know when each plant bloomed. She had to know how to dry each herb properly to prevent mold and retain its potency. Some plants might be most effective fresh, but others are toxic fresh and must be dried before use. Then she had to know how to prepare them — how to make herbal teas and other medicines for internal use, as well as salves, ointments and poultices for external application. And finally, of course, she had to know the curative properties of each herb — potentially hundreds of available plants. And she would have learned all that informally, by tramping through the woods with a mother, grandmother, or aunt who was herself collecting herbs, by helping that older relative prepare medicines and accompanying her on visits to the sick. Most women grew or collected some herbs to use for prevention and home remedies; a community practitioner would likely have been called in only when the matter was serious. A wealthy housewife might own one of the many “herbals” published in the 18th century, which gave detailed instructions on the uses and preparation of hundreds of wild and cultivated herbs. The most popular one in early America was by Nicholas Culpeper, who gave detailed and astrological explanations for the effectiveness of practically every herb available to him. But cookbooks also contained recipes for herbal medicines. In fact, the line between food and medicine was fuzzy, at best. Nicholas Culpeper, author of the most popular herbal in colonial North America. The most popular cookbook in colonial America, for example — The Art of Cookery, by the English writer Hannah Glasse — called for herbs in great profusion for both culinary and medicinal purposes. In soups and stews she nearly always called for herbs alone or in combination — thyme, parsley, marjoram, savory, or simply “a bundle of sweet herbs,” which she called for more than forty times — not to mention onions and horseradish, as well as a range of spices, most commonly cloves, mace, and nutmeg. Each of those cultivated herbs and spices had medicinal uses, of which Glasse and her readers were well aware. Her book contained an entire chapter of “waters” made from various herbs, with names like “plague water” and “hysterical water” that suggested their uses. Until the 20th century, in fact, a great many cookbooks included information about home health and care for the sick — under the assumption, nearly always valid, that the housewife would be the one overseeing both the food and the medicine for the family. Note that all, or nearly all, of the herbs required for Glasse’s “plague water” are cultivated ones, grown in gardens. If you were a more serious herbalist – or if you had servants and therefore the time and labor for such things —you could graduate from teas to distillations. Glasse gave a design for a stovetop still from which she distilled her “waters,” and it isn’t too different from modern designs you can find on the internet. (Don’t get excited; it’s not a practical design for making whiskey.) You place the herbs and water in the bottom of a large pot, and set a bowl on a brick in the pot so that the bowl is out of the water. Then you cover the pot and bring it to a boil: As the water boils, it will condense on the inside of the lid and drip into the bowl, leaving you with a pure herb-water. That, for example, is how women traditionally made rose water, which was a common fragrance, medicine, and flavoring until the middle of the 19th century. Distilling rose water on the stove top. Stoves have changed, but the process hasn’t. Photo by Flickr user chronographia licensed Creative Commons. is a noble strengthener of the lungs, as notable a one as grows; neither is there scarce a better remedy growing for that disease in children which they commonly call the Chin-cough, than it is. It purges the body of phlegm, and is an excellent remedy for shortness of breath. It kills worms in the belly, and being a notable herb of Venus, provokes the terms, gives safe and speedy delivery to women in travail, and brings away the after birth. It is so harmless you need not fear the use of it. An ointment made of it takes away hot swellings and warts, helps the sciatica and dullness of sight, and takes away pains and hardness of the spleen. ‘Tis excellent for those that are troubled with the gout. It eases pains in the loins and hips. The herb taken any way inwardly, comforts the stomach much, and expels wind. So its ubiquity in cookbooks can be explained by the fact that it tastes good and that its flavor pairs well with lots of others; that it’s fairly easy to grow in gardens; or by the fact that it was considered practically a panacea with no negative side effects. Here’s another example. In the 18th and early 19th centuries lots of fancy cakes were flavored with rose water — both “great cakes,” which might be topped with icing perfumed with more rose water, and small cakes that we’d call cookies. Even gingerbread was sometimes flavored with rose water, when women wanted to make a fancier version of it. Now that seems a surprising combination, but rosewater and ginger actually pair nicely as flavors. And rose water had a great many medicinal uses. According to Culpeper, rose had a “binding and astringent property” that was “very good for the head-ache, and pains in the eyes, ears, throat, and gums,” purged phlegm and cholar, dried rheumy and watery eyes, eased St. Anthony’s fire and diseases of the stomach, and “Being dried and beaton to powder, and takin in steeled wine or water, it helps to stay women’s courses.” An earlier herbal said similarly that rose could help in “constraining and comforting of the flux in the womb.” Rose water may strike most of you as a feminine aroma, and in fact two hundred years ago it was enjoyed especially by women — and it I wouldn’t say that it’s objectively a feminine or a demure sort of flavor; it’s quite assertive, in fact. That association may, perhaps, come from its role in medicine. This association between food and medicine goes back to the Middle Ages in Europe — in fact, back to the classical period. We all know what Europeans did to get spices — sail round the horn of Africa, head west across the Atlantic and stumble into the Americas, fight wars over tiny islands in Indonesia. And those who could afford them used a great many spices in their cooking, indeed in almost every dish. In medieval manuscript cookbooks even the simplest foods appear laden with spices. But cooks of all classes also used a lot of herbs, which were far easier to come by. All this stems from a worldview that linked food, the human body, nature, and the occult. The ancient Greeks, in trying to understand the natural world, decided that everything in the universe was made of four elements in varying proportions: earth, water, air, and fire. Those elements in turn had certain core properties that described everything made of them: they were hot or cold, and moist or dry. Thus earth was cool and dry, water cool and moist, air hot and moist, and fire hot and dry. The Roman physician Galen codified an understanding of the human body built around four essential humors, or fluids: blood, phlegm, yellow bile (or choler) and black bile. And each humor shared the properties of one of the four elements, and was thus linked to it: blood was hot and moist like air; yellow bile hot and dry like fire; black bile cold and dry like earth; and phlegm cold and moist like water. Because balance was critically important to the ancients, it seemed obvious that maintaining health should require maintaining a balance of those four humors in the body. But how to do that? One way to restore balance, once the balance had been upset, was to forcibly remove the excess humors — hence the bleeding of patients, to remove excess blood, and various emetics and purges that would encourage the emission of other humors. The less said about most of that, the better. But a better way to maintain balance in the first place was by paying careful attention to what one put into the body — food. Each food, being made up fundamentally of the four elements in varying proportions, could be described as hot or cold, moist or dry, and consuming foods with particular properties caused the body to produce more of the humors that shared those properties — or less of those that opposed them. Thus eating foods that were cold and moist could encourage the production of phlegm, a bad thing if one had a head cold — especially since the humors were the cause, not the symptom, of the disease. All that snot caused the head cold, it wasn’t merely produced by it, and so it was crucially important to dry it up — by eating foods that were, by contrast, hot and dry. Now note that “hot” and “dry” don’t only describe the temperature of the food or how much moisture it contained; they also describe inherent properties and the effect of the food on the body. And those properties should be balanced in cooking. So, for example, pork (cool and wet) should properly be roasted (thus warming and drying it), while rabbit (which was warm and dry) ought better to be boiled. Why pork should be thought cool and wet while rabbit was warm and dry is, thankfully, beyond the scope of this discussion; suffice to say that it was. Of course, foods might also be combined to achieve the proper balance. Pork could be paired with ginger, which was hot and dry—as it was in something called Mortreus de Chare, which mixed ground pork into a paste with bread crumbs, ale and egg yolk along with ground ginger. And this was especially important for one already sick — for one whose humors were out of balance. Eating too much fish when you already had a cold could push one’s body further out of balance and lead to pneumonia. Better to huddle in bed and drink spiced wine (hot and dry). Or to eat gingerbread — very hot and dry indeed, with all those spices. The four temperaments. A woodcut by Johann Kaspar Lavater, c. 1775-78. All such with good pot herbs, should follow the plough. And others the like, or else go like a fool. With sirops, that easeth the sickly so much. That either food or physic yield. The Garden of Eden by Lucas Cranach der Ältere, 16th century. Every plant, in short, had some purpose in the life of humans. The trick was figuring out what that use was. If the system of humors and elements was too complicated, Europeans and European-American settlers had other folk beliefs to guide them. One was the idea that the remedy could be found near the affliction. Rheumatism, for example, was aggravated by living in damp conditions, and the willow bark that grew in swamps could ease it. (Interestingly, aspirin contains the chemical substitute for the salicylic acid in willow bark.) To cure poison ivy one could rub on the rash whatever plant was found growing nearest the ivy, and afflictions that produced unpleasant odors might be cured by eating a plant with a similar smell. And plants that looked like a given part of the body logically ought to help that part — hence walnuts should be good for the brain, and beans (especially kidney beans) for kidneys. Sometimes the different ways of identifying proper herbs for a malady coincided; sometimes they contradicted. And so what arrived in North Carolina with the first European settlers was probably a bit of a mishmash of tradition, common sense, pseudoscience, and practical experience. 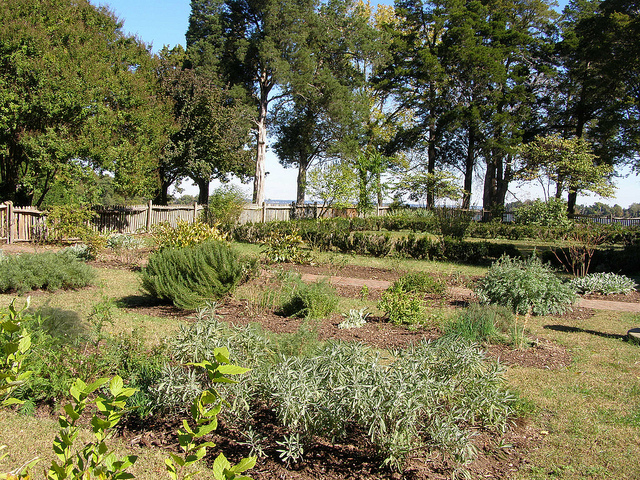 Of course the first European colonists in North Carolina had some disadvantages in trying to apply what they knew about herbal medicine: to the extent that they had relied on wild herbs, the herbal landscape here was very different from what they’d known in Britain. But the Europeans were not the only people to have come up with a system of herbal medicine: every people and every culture has had some kind of medicine, and before the 20th century, that meant they used herbs to cure what ailed them. And so in this as in so many other areas, European colonists learned from American Indians. Fraser’s Sedge, used by the Cherokee for skin conditions. Photograph by Flickr user BlueRidgeKitties licensed Creative Commons. When the Plants, who were friendly to Man, heard what had been done by the animals, they determined to defeat the latter’s evil designs. Each Tree, Shrub, and Herb, down even to the Grasses and Mosses, agreed to furnish a cure for some one of the diseases named, and each said: “I shall appear to help Man when he calls upon me in his need.” Thus came medicine; and the plants, every one of which has its use if we only knew it, furnish the remedy to counteract the evil wrought by the revengeful animals. Even weeds were made for some good purpose, which we must find out for ourselves. When the doctor does not know what medicine to use for a sick man the spirit of the plant tells him. The Cherokee system of understanding disease and medicine was quite different from that of the Europeans. As James Mooney, who wrote down that myth in the late 1800s, explained, “The white doctor works on a disordered organism. The Cherokee doctor works to drive out a ghost or devil.” In other ways they were quite similar. Some plants were selected because their appearance resembled the disease: for example, milkweed for milky urine. Some were selected because their appearance selected a cure, such as the unrolling of a fern for rheumatism. And plants with unusual configurations of growth — a lightning-struck tree, for example — were thought to have particular powers. Like Europeans, the Cherokee made their herbs into teas and poultices, or sometimes simply chewed a root; they also used a sweat bath, in which medicine was poured over heated stones while the patient inhaled the fumes. Of course, as in every traditional medicine, a lot of trial and error must surely have been involved, and traditional Cherokee medicine seems to have been at least as effective as the European medicine of the day. European travelers thought so. James Adair, traveling through the Appalachians in 1775, wrote that the Cherokee “seldom if ever fail to effect a thorough cure from the natural bush…. I would prefer an old Indian before any surgeon whatsoever, in curing green wounds by bullets, arrows, etc. both for the certainty, ease, and spediness of cure; for if those parts of the body are not hurt, which are essential to the preservation of life, they cure the wounded in a trice.” Many whites saw Cherokee medicince as confirmation of their own Christian views: in 1849 James W. Mahoney concluded in The Cherokee Physician that “the all-wise creator in the infinitude of his mercy, has furnished man with the means of curing his own diseases, in all the climates and countries of which he is an inhabitant.” Some American Indians made a successful business of selling herbals to white settlers, since they knew what of the local flora worked and where to find it — for example, dogwood bark to treat fevers and set bones; goldenseal for thrush, sore mouth, or sore eyes; and wild geranium as styptic and anti-diarrheal. When Africans arrived here as slaves, they, too, brought their own traditions of medicine, both from Africa and from the Caribbean, and they, too, learned from both Indians and white people. Now, slaves faced particular difficulties in dealing with professional doctors. For one thing, they didn’t have much access to formal medicine; few slaveholders were willing to spend the money on a doctor unless the matter was extremely serious. For another, though, African Americans were even less inclined to trust white doctors than most white people were — and with good reason — and so slaves were particularly inclined to deal with health matters on their own whenever possible. And when doctors did get involved, they were hampered not only by the general shortcomings of the medical knowledge of the time, but also by their racism. Many believed that Africans had different physiologies from whites — though that could also benefit the patient. Doctors thought that Africans’ constitutions simply wouldn’t hold up to so much bleeding, for example, and so they were spared that particular remedy. View through the window of the slave quarters at Stagville State Historic Site, Durham, N.C. Photo by the author. And so African Americans, for the most part, handled their own healing, just as whites did. Herb doctoring was often learned and practiced in secret, for fear of punishment from plantation owners who wanted to control slaves’ medicine. Yet there were slave herb doctors who gathered herbs and compounded them into medicine, then served blacks as well as whites. Slaves gathered wild herbs when they could, and where possible they also maintained herb gardens. Rachel Perkins, a former slave from Arkansas, recalled growing “mint, rosemary, tansy, sage, mullen, catnip, horseradish, artichokes, horehound — all good remedies.” They also used the bark of oak and dogwood, pine needles, sea myrtle, milkweed, mustard weed, poke root, and other wild herbs. Like a lot of white and Indian folk medicine, that of slaves also had a spiritual dimension, incorporating charms, signs, incantations, and spells. Many people associated illness with curses and hexes. Slaves might wear herbs or place them in strategic locations in their quarters. For example, saw palmetto leaves placed in crosses over the doorway could remove hexes and protect the household. 5. But did it work? We also have to give credit where credit is due. Many of these herbs and spices did, in fact, have medicinal purposes. For example: A study published in the British medical journal The Lancet found that 940 mg of powdered ginger was more effective at preventing nausea than 100 mg of the over-the-counter motion-sickness drug Dramamine. That’s the amount of ginger in two colonial-era gingerbread cookies, versus two pills. Bloodroot was used as a mouthwash; in fact it has an antiplaque agent and may be effective for gingivitis. Clove oil is still good for toothaches. And fennel has anti-inflammatory, antibacterial, and anti-fungal properties, and lowers blood pressure, and as been approved for cough, bronchitis, and dyspeptic complaints by the German equivalent of the FDA. Of course, there were plenty of traditional herbal cures that don’t do any better than a placebo, and some were actively dangerous: two whole nutmegs, for example, is enough to kill you. Still, the success of many of these cures suggests a way that these ideas came about: people noticed, hundreds or thousands of years ago, that particular plants taken in particular ways had particular physiological effects. It’s when people started trying to systematize that knowledge that they got themselves into trouble. It’s natural to want to know why something workds, of course, and to develop a theory about it, but you’d best test your theory before you draw any conclusions from it that have implications for life and death. Otherwise you wind up with the four humors. And the alternative, when there was one, wasn’t much better. Doctors started looking for an alternative to the four humors theory in the seventeenth century, but between then and the discovery of germs in the 1860s there were a lot of false starts. In the United States during the first half of the 19th century, the most popular theory was that all disease was caused by “debility,” which was in turn caused by overstimulation. One way to reduce stimulation was — again — to bleed the patient. But the theory of debilitation also had implications for diet. Eating too much spicy food would overstimulate the body, and especially the delicate lining of the stomach, thus in the long run overtaxing and debilitating it and making it susceptible to all sort of maladies. Sylvester Graham, the health reformer for whom Graham crackers are named, blamed the cholera epidemic of 1832 on diets that included too many spices, condiments, meat, and alcohol, all of which were thought to be stimulating. An interesting theory, but just as wrong, in its own way, as the humors. of the blood descending to the second generation, it stands unrivalled. it may be administered to the most tender and helpless infant. Here’s another patent medicine, just for kicks: Here’s a trade card for Mrs. Winslow’s Soothing Syrup, 1888, which soothed children because it contained a good deal of morphine. When it comes to food, we might also ask how seriously people took all this advice about herbs and health – not whether they believed it, but how much they actually did about it. Americans today are privy to unfathomable realms of information about the nutritional value and medicinal consequences of our food, and yet we’re all going outside after this talk to eat hot dogs and potato chips and drink soda. So let’s not ignore the fact that when people ate herbs, it’s also because they tasted good. So, for example, Gervase Markham, a cookbook author of the 17th century, offered a recipe for a salad involing violets, cowslips, roses and marigolds strewn on a bed of red sage, mint, lettuce and spinach — all of which had medicinal properties, but the point was to taste good and look beautiful on the table. And people do seem to have enjoyed herbs and spices a great deal. The gingerbread eaten in early America called for as much as three tablespoons of powdered ginger per pound of flour, and people ate it as an almost daily snack, far beyond any medicinal purpose the ginger might have served. An herb salad similar to Markham’s. Photograph by Paul Larkins. As for herbs, if you have them right outside your door, you’re more apt to use them, and to find uses for them. The traditional English pottage, for example, was a simple dish, a cheap cut of beef or mutton, boiled, and its broth thickened with oatmeal. But Gervase Markham thought the best “ordinary” pottage was seasoned with “violet leaves, endive, succory, strawberry leaves, spinach, langdebeef, marigold flowers, scallions, and a little parsley,” all chopped fine — and twice as much of them as the cook used oatmeal! Now Markham was writing for the well-off, so his notion of an “ordinary” pottage was a little fancier than most, but one could, and would, substitute whatever one fancied, had available, or found in season. Similarly, an early American “pottage” of salt pork and beans gets tiresome after awhile, but it helps if you’ve got thyme and rosemary to add — and herbs like those don’t take much tending, which was a boon to the busy housewife. The question now is, why did all this change? Why do so few of us have herb gardens anymore, and why don’t we eat a lot of these herbs? It’s easy enough to see why most of us don’t rely on herbal medicine any longer — although it would be simplistic to say that scientific medicine replaced it. Homegrown herbal medicine was declining by the second half of the nineteenth century, well before all those old remedies had chemical substitutes — and at the same time, a study just 30 years ago of the region around Chattanooga, Tennessee, found dozens of herbalist practitioners still active. And that doesn’t explain why herbs fell out of favor for cooking — or does it? Food and health will always be linked, of course, and changing notions of medicine in the 19th century undermined some traditional ways of eating. The theory of debility, to which well-to-do Victorians subscribed, made strong flavors of any kind suspect. So did Victorian manners, which emphasized controlling one’s appetites and keeping one’s eating to oneself — even to the point of not complimenting the hosts on the dinner, lest they think you a glutton who had taken too much bodily pleasure in the meal. Herbs weren’t implicated in any of the fears about overstimulation, but the growing disdain for strong flavors seems to have taken them out as well. Rose water, for example, had virtually disappeared from American cooking by 1870. The decline of gardening was probably a bigger factor. As more people moved to towns, they had less space. Over the course of the nineteenth century middle-class women in towns were increasingly able, and therefore inclined, to pay for things they had once had to produce themselves — like soap and cloth — and Victorian notions of middle-class propriety also discouraged grubbing in the dirt. And then there was simple transience. The second quarter of the 19th century saw more interstate migration in the United States than at any time before or since. Migration disrupted the transmission of knowledge from one generation to the next, which undermined traditional herbal medicine — it wasn’t, for the most part, something that people learned from books. And to the extent that they rely on wild herbs, herbal cures are very localized. New Englanders and North Carolinians had to rely on different plants, the prairie was different again, and westward migration meant the loss of potentially generations of knowledge about the available plants in a place. For the Cherokee, forced removal to Oklahoma — along the “Trail of Tears” — meant the loss of thousands of years of accumulated knowledge. Transience also makes gardening more difficult. Many herbs are perennials that take years to establish, and people in less developed parts of the country had less access to seeds and seedlings. Moving to someplace with a very different climate makes gardening difficult, and herbs weren’t the first priority on a homestead — corn and pork and potatoes were. And gardening, too, relied heavily on knowledge passed down from generation to generation, which was harder to maintain as family ties were attenuated. The traditional “kitchen garden” was a casualty of American mobility. For most fruits and vegetables, technology and industry filled the gap — but not for herbs. By the 1920s, progressive Americans were buying their fruits and vegetables in cans. And as early as the 1890s, culinary herbs could be bought dried — but not all herbs dry well, and with those that did, packers didn’t take the same care that housewives once had done; crumbling them into cans that were far from air-tight was hardly a substitute for keeping leaves whole until they were needed. Fresh markets were little help; without refrigeration, even the hardiest herbs don’t stay fresh more than a few hours. And even with refrigeration, many delicate herbs won’t survive shipping except in hard plastic containers that, until very recently, didn’t exist. Many herbs couldn’t survive the transition from home-grown to store-bought food, and they simply disappeared. If you wanted herbs in the 19th century, you really had to grow them yourself, and given the sad and paltry selection at most supermarkets, that’s still pretty much true today. And so I want to close with a plug for herb gardens. My first herb garden, freshly planted. In 1878, a woman named Juliet Corson published a little pamphlet called Fifteen-Cent Dinners for Families of Six. That didn’t sound much more plausible in 1878 than it does today, but Corson was devoted to her cause. She had founded the New York Cooking School a few years earlier, and she used the proceeds of courses on fancy cooking for middle-class women to pay for scholarships for working class women and girls who needed training to become domestic cooks. She published the pamphlet at her own expense, and she gave away thousands of copies to wives of factory workers in New York. She received some criticism from unions, who feared that if factory owners found out how little their employees could live on they’d cut their wages even further, but overall her efforts seem to have been very well received. Most of what Corson recommended could have come from an earlier age — or still rings true today. Cook cheaper cuts of meat, or do without meat altogether. Make stews wth starches and legumes — pottages, essentially. Learn to do all the work yourself, and to do it well, in ways that save time as well as money. And season your food to vary its flavor and make it more interesting. Specifically, Corson said, plant an herb garden! Anyone, she said, could plant a few herbs in a window box and use them to liven your dinners. Herb gardens were already on the way out by 1878, and it isn’t clear that Corson had much success in reviving them in the tenements of New York City. But she was right. If you are cooking your own food, and doing it without extravagant expense of money or time, fresh herbs are one of the best ways to jazz up a frugal meal. You can, of course, grow herbs in pots on a porch or in window boxes. If you have a tiny little bit of space that gets partial sun, you can also put in a raised bed, as in the photo above. That garden consisted of two four-by-four-foot frames, screwed together from 2×6 boards, filled with a combination of peat moss, vermiculite, and compost — really, any decent soil that drains well will do, but the better the soil the more intensive you can be. Planted in that photo are rosemary, thyme, sage, chives, lemon thyme, oregano, dill, tarragon, parsley, and garlic chives. In summer the boxes held a bit of basil and Thai basil, and occasionally savory, cilantro, nasturtiums, fenugreek, and a few other things. Once they’re planted, they don’t take much maintenance; most of them are perennials; just an occasional watering is all they need. And you have a little old-time goodness just a few feet from your door. Super post. Very informative. I really enjoyed the read over my morning tea.